Writes pantry-saint Michael Pollan, "You may think of [Child and Steinem] as antagonists, but that wouldn't be quite right. They actually had a great deal in common... and addressed the aspirations of many of the same women." To Michael Pollan, the nascence of Julie and Julia's paeon to celluloid gastronomy prompts a New York Times Magazine meditation on why the birth of American cuisine should have coincided with the death of the American diet. To be sure, he concludes, there's a corollation between cooking-as-specttaor sport and that Julia Child ushered in and, you know, actual cooking. But for all the disspiriting conclusions Pollan can't help drawing about our culture and our planet, there are some serious bright spots amidst the rubble. And a major one is Child-as-empowerer. Julie Powell operates in a world that Julia Child helped to create, one where food is taken seriously, where chefs have been welcomed into the repertory company of American celebrity and where cooking has become a broadly appealing mise-en-scène in which success stories can plausibly be set and played out. How amazing is it that we live today in a culture that has not only something called the Food Network but now a hit show on that network called "The Next Food Network Star," which thousands of 20- and 30-somethings compete eagerly to become? It would seem we have come a long way from Swanson TV dinners. 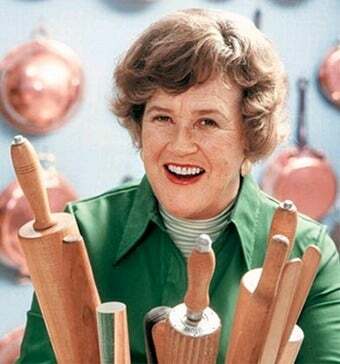 And Julia Child, he adds, had a lot to do with this. More than just the popularizer of soigne French cuisine, Child, ironically, managed to free women from kitchen drudgery with her laborious, multi-pan recipes. Julia never referred to her viewers as "housewives" - a word she detested - and never condescended to them. She tried to show the sort of women who read "The Feminine Mystique" that, far from oppressing them, the work of cooking approached in the proper spirit offered a kind of fulfillment and deserved an intelligent woman's attention. On a personal level, like Friedan, Child was a housewife who'd found herself and made a career. Maybe a career that centered on a traditionally feminine sphere, but never one that depended upon an exaggerated femininity or sense of debasement. Child was, famously, "alone in the kitchen" - not preparing dinner for a husband or children, but for pleasure and accomplishment. To suggest that Child destigmatized cooking for women, or removed the burden of context, would be absurd - the reactions to Amanda Hesser's recent piece on Michelle Obama's lack of interest in cooking is testament to this. And it also can't be denied, as Pollan points out, that obviously both parents entering the workforce had an adverse effect on the nation's eating habits, since we had never learned to balance domestic and professional duties, seeing them as stubbornly either-or. But, as Judith Jones points out in her wonderful The Tenth Muse, Child made good food democratic, removed some of the barriers that separated "fine cooking" from "cooking" and in so doing added an element of discovery and pleasure to an everyday ritual. It's not an unmixed legacy; many would surely claim that Child's focus on French cuisine served to maintain the underlying classicism of fine cooking that persists to this day, making good food's proliferation more fraught and tricky. But this was not her intention. And no one can deny that Julia's influence directly impacted on the American cuisine movement, and later, local, slow, and organic food in this country - all of which have been heavily influenced and run by progressive women. Should Michelle Obama Get Back In The Kitchen? And, as Pollan says, it's Child who allowed Powell to recapture an identity and a career, through food - a career that plays with traditional roles while confident in its autonomy. And be played by Amy Adams. And if that's not progress of a certain measure, well, I don't speak fluent American dream. Related: Should Michelle Obama Get Back In The Kitchen?